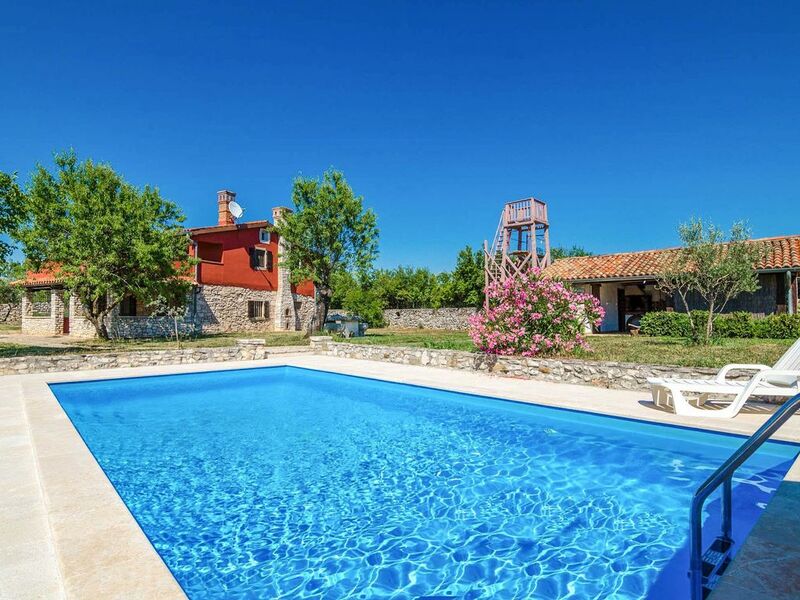 Villa Paradiso is situated in Labin, Istria. Our holiday rental property sleeps up to 6 people. Villa Paradiso has has 3 bedrooms. The Villa can sleep up to 6 people. Additional Pool Feature: Sun Beds. There is also a Barbecue. Full Payment Protection: Book with HA! Villa Paradiso is Paradise! Privacy, spacious efficient. Great outdoor living in large private grounds and lovely pool. The villa had a great pool and was in an amazing setting. We loved it particularly because it was so spacious and we could eat in so many of the outdoor terraces. The sauna was fantastic and we used it every day. The kitchen was well equipped and we are ate at the villa every evening. There were fig and olive trees in the garden and the owners were very happy for us to enjoy the figs. In the extensive gardens we saw black squirrels every day. The nearby towns of Rabac and Labin were gorgeous and well worth a visit. The old part of Labin on the hilltop has great views and a couple of nice places to eat. Rabac is a peaceful seaside town and each evening we drank cocktails and listened to the tinkling boats bobbing around in the water. It was a great holiday. Thank you. Went on holiday with my husband, Mother-in-law, son, 2 year old granddaughter, daughter and son-in-law. We all fitted perfectly in this stunning villa and had a fantastic holiday. The villa and pool was clean and well equipped. Lovely Property, People and Food! We returned last week from a very relaxing (and much needed) break away from the busy life at home. We wanted a traditional stone property, that was nice inside, and Villa Paradiso did not disappoint. Visnjan was a very pretty village and the local taverns served wonderful food and wine! Local spring flowers carpeted the walk from the villa to the village - it was heaven. The rest of Istria was pretty too, especially the water-side town of Rovinj, which we drove to twice. I would be very happy to recommend the property and would consider staying again another time. Forgot to mention the sauna - we used it every day! It was a nice touch and we hadnt realised it had one when we booked. Thank you so much.